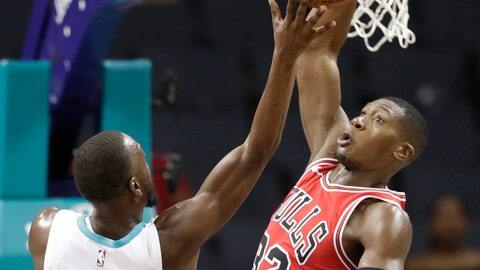 CHARLOTTE, N.C. (AP) — The Charlotte Hornets are looking to change their style of play. The Hornets have been working with a 12-second play clock since the summer under first-year coach James Borrego in an effort to dramatically improve their pace of play. Borrego believes he has a team that is athletic enough — and fast enough — to push the ball up the floor to get more easy baskets, more open looks and create open 3-pointers. It’s been a challenge for the players, but they say they’re adapting well. “It was interesting for me that first day, to say the least,” said veteran forward Marvin Williams of the 12-second shot clock. Williams joked that at first the Hornets were running down the court and simply launching 3-pointers without much passing. But that changed as they got used to playing at an increased pace. The Hornets have grown to like Borrego’s offense. Borrego, who joins the Hornets after working as an assistant under Gregg Popovich in San Antonio, felt this was the right move to make after evaluating the roster — not to mention back-to-back 36-46 seasons. Of course the offense will continue to run through two-time All-Star point guard Kemba Walker, the franchise’s all-time leader scorer. It’s clear the Hornets want to keep Walker happy and make sure he re-signs next summer when he becomes an unrestricted free agent. Walker seems keen on doing that, saying “This is where I want to be. I don’t want to be nowhere else. You see guys wanting to leave teams and stuff like that. I don’t want to do that.” The Hornets will surely do everything they can to make sure Walker is an All-Star for the third straight season, especially with the game being played in Charlotte. With Jeremy Lamb likely to start at shooting guard and Nic Batum moving to small forward, Michael Kidd-Gilchrist finds himself coming off the bench for the first time in NBA career. It’s yet another reminder of just how much failing to land the No. 1 pick in the 2012 NBA draft set this franchise back. The Hornets finished 7-59 in the 2011-12 season — the worst winning percentage in NBA history — yet New Orleans bucked the odds and won the lottery, securing the rights to franchise center Anthony Davis. Davis is a five-time NBA All-Star. The Hornets selected Kidd-Gilchrist at No. 2, and he’s now a reserve on a below-average team. Rookie Miles Bridges from Michigan State has been a pleasant surprise for the Hornets in the preseason and has likely played himself into a significant role with the team. Bridges has shown outstanding athleticism through a series of high-flying dunks and has a surprisingly solid shooting touch from outside. It’s expected he’ll start out with the second team behind Williams at power forward, but the potential is there for Bridges to assume a starting role in the not-so-distant future. Tony Parker left the Spurs after 17 straight playoff seasons because he liked the role he was offered in Charlotte. Parker will play with the second team most of the time, but will see action on the floor late in games playing alongside Kemba Walker, according to Borrego. Parker said he didn’t like the role of “player-coach” that the Spurs offered him, saying he wants to focus on being a player because he still has something left in the tank after an injury-plagued season with the Spurs.